Attention San Francisco Giants followers, your favored sports team is on its way to your location. Team up with your other San Francisco Giants supporters as they engage their opponents very soon. CheapTicketsASAP.com has the very best available tickets at affordable prices, so don't miss this opportunity to wear your hat and jersey and get that big foam finger out of the garage. You never know what is going to happen when these teams square off, so benefit from the opportunity to be there. Route your browser to CheapTicketsASAP.com and let our knowledgeable staff help you find the tickets you want today. 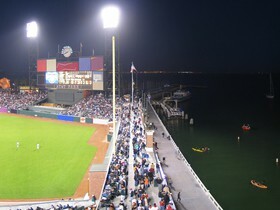 To learn more about San Francisco Giants tickets, in addition to other sporting events visiting venues in your area, please go to CheapTicketsASAP.com for all of your sporting event info and ticket requirements. We are happy to help make sure you don't lose out on any of the games you want to attend. CheapTicketsASAP.com acts as an intermediary between buyers and ticket sellers to facilitate the purchase and sale of San Francisco Giants tickets, and as such is not directly involved in the actual ticket sale transaction between the buyers and TICKET SELLERS. All sales are final. As tickets sold through CheapTicketsASAP.com are often obtained through the secondary market and prices are determined by the individual seller, the prices for tickets may be above or below face value. San Francisco Giants Tickets sold through CheapTicketsASAP.com are from a third party; therefore, the buyer's name will not be printed on the tickets. Tickets may be sent by email when stated so. Please note that the name on the tickets does not affect the buyer's ability to access the San Francisco Giants event.